Simply put, yellow living room accents are impactful. No matter which shade you choose — from canary yellow to marigold — the color will immediately attract attention and lift your spirits in a way that no other color can. Whether you try it in small doses or choose to go all in, the right shade will infuse your space with personality and creative flair. 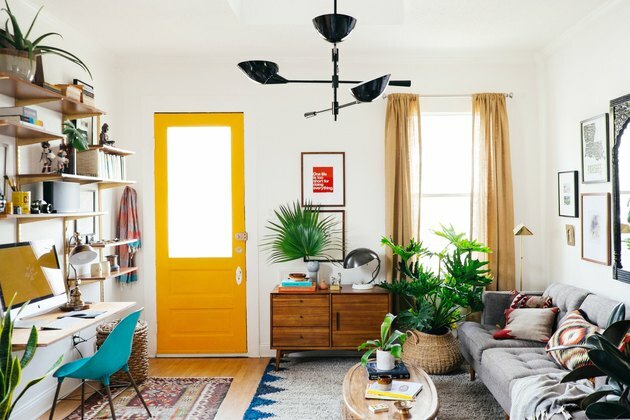 Still, it's completely understandable if you're a little hesitant, but to help ease your fears, here are six yellow living room accent ideas that are remarkably stunning. 1. Pair with warm woods. 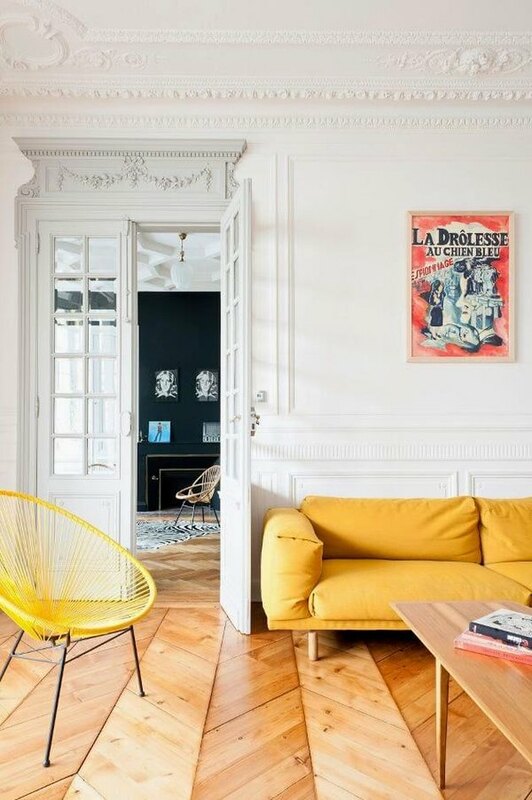 In this eye-catching apartment in Bordeaux, France, the modern interior design balances the older architectural details, while the warm herringbone pattern wood flooring complements the yellow furniture. 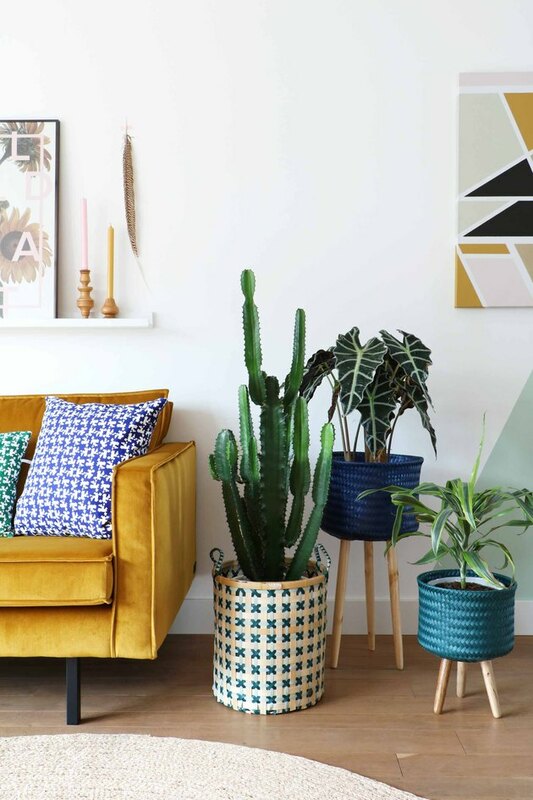 We all know that velvet is a popular trend in home decor, and when done in yellow like Marij from My Attic's sofa, the results are even more striking. The luxurious texture helps soften the bold hue, making it equal parts inviting and invigorating. 3. Warm up minimalist decor. 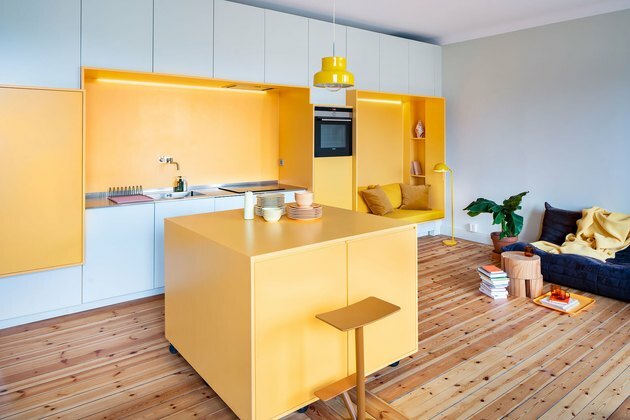 This minimalist apartment photographed by Mattias Hamrén is far from cold, thanks to canary yellow color blocking used throughout. The vibrant hue is woven into the architectural design of the open floor plan, resulting in a unique accent that leads the eye from the kitchen to the bright yellow reading nook in the living area to the yellow throw on the sofa. 4. Create a focal point. When you have a lot going on in your living room, creating a focal point using a pop of yellow gives your eye a place to rest. Dabito from Old Brand New did just that by painting his living room door an orange-ish shade of yellow that pops right off the hinges. You don't have to paint your entire living room yellow — keep it simple. 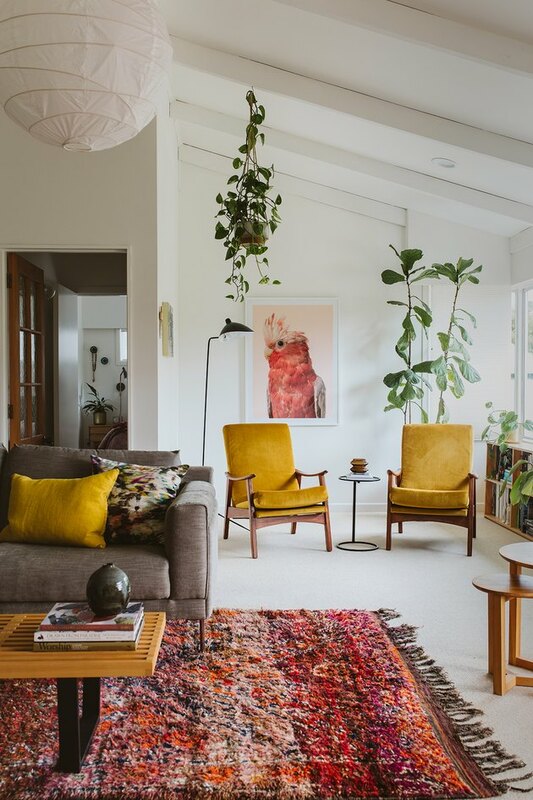 Photographers Brooke Lean and Gina Fabish from The Virtue captured this boho-chic living room showcasing a pair of yellow accent chairs and a yellow throw pillow — a splash of the vibrant hue goes a long way. Amp up the drama in your living room by playing with contrast. 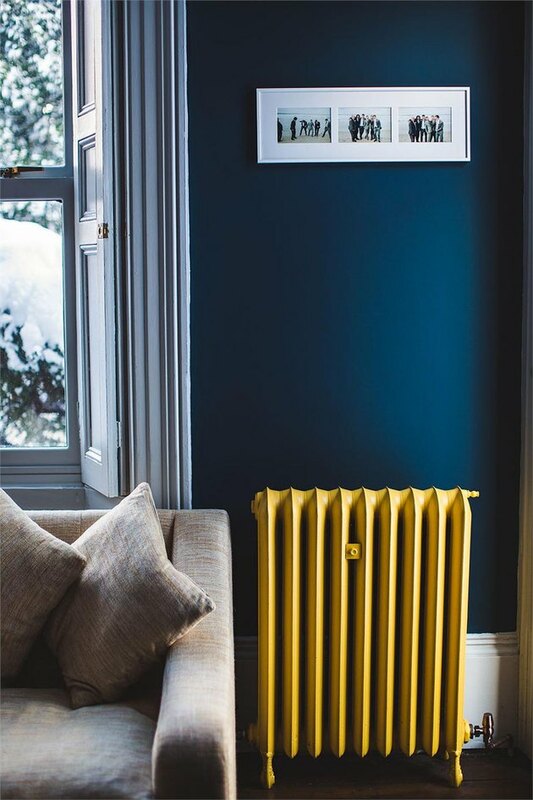 We love the way the moody dark blue backdrop in this space balances the bright yellow radiator painted in Babouche by Farrow & Ball.